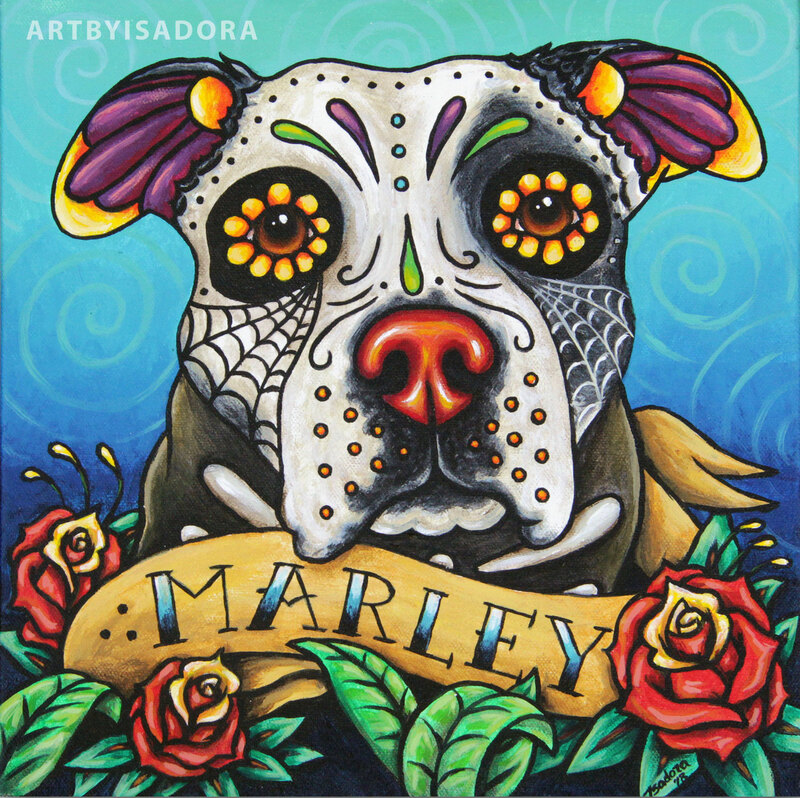 Pet Portrait Sale Going on Now! 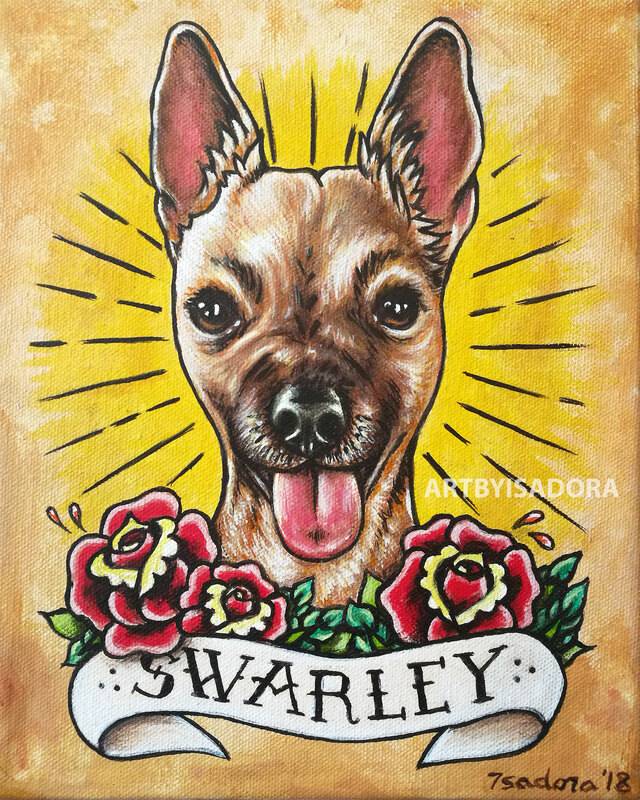 All of my custom portraits are on sale while I try to beat this Arizona heat by staying inside in the AC, painting amazing portraits for my customers! 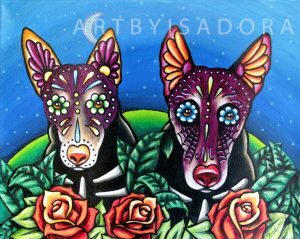 Whether you’d like a traditional pet portrait, a colorful pet portrait, a Day of the Dead style pet portrait, a memorial pet portrait, or even a portrait of a person, it is all on sale! 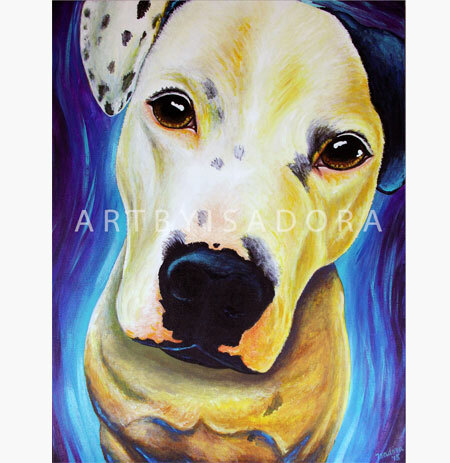 Simply click here to go to the custom portraits section of my Etsy store, select your custom portrait style and size, and then in checkout enter the coupon code SUMMERHEAT for 10% off of your entire order! This sale will continue through the end of July, so tell your friends… I hope you’re finding your own way to stay cool this summer! 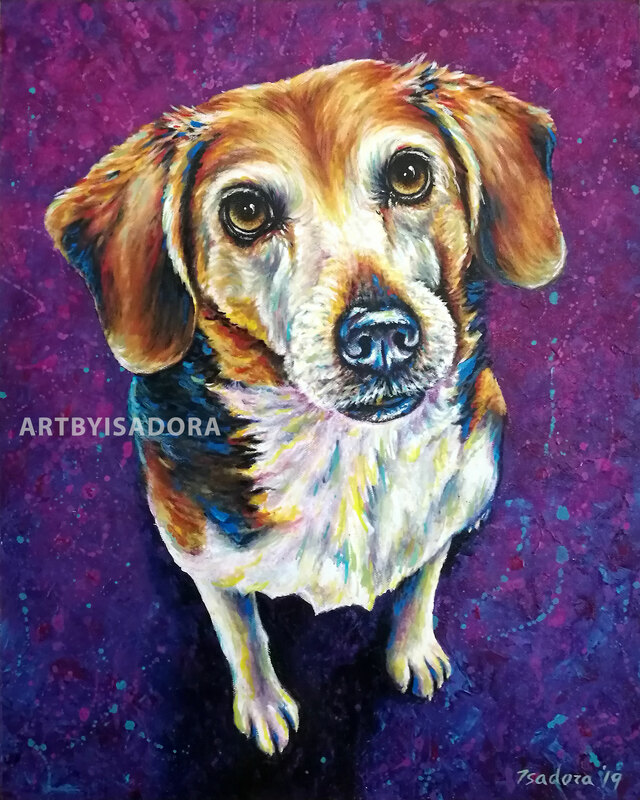 A customer recently told me that she wanted a portrait painted of her dog because the painting would be able to capture the essence of her dog, while a photo only captures a moment. I thought that was a really beautiful way to put it. 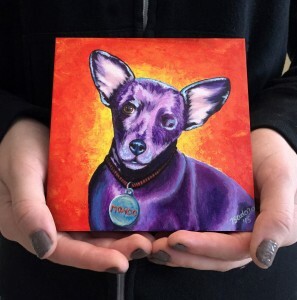 When we got started on her custom portrait, she sent me photos, videos and lots of loving details about her dog, Pepper. 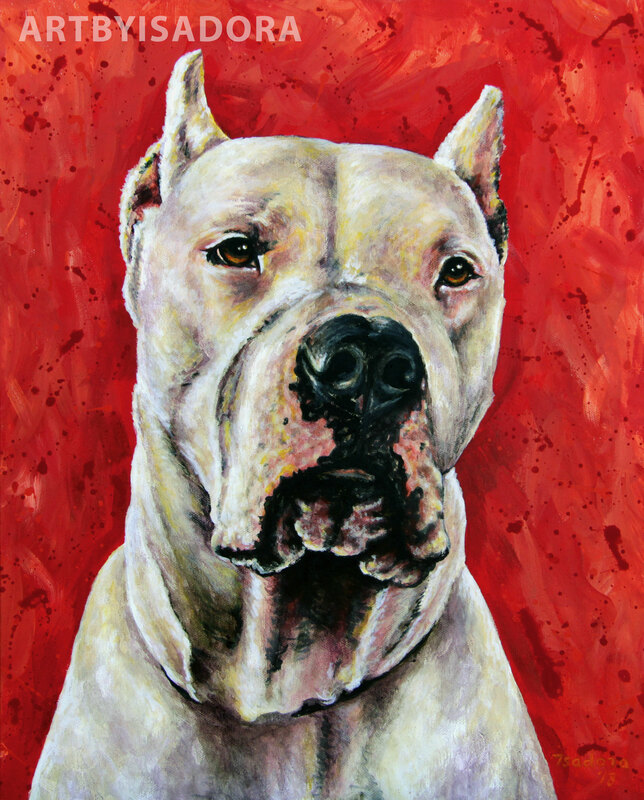 I felt like when I got started on even just the preliminary sketch work, I knew her dog and he was coming to life in front of me. 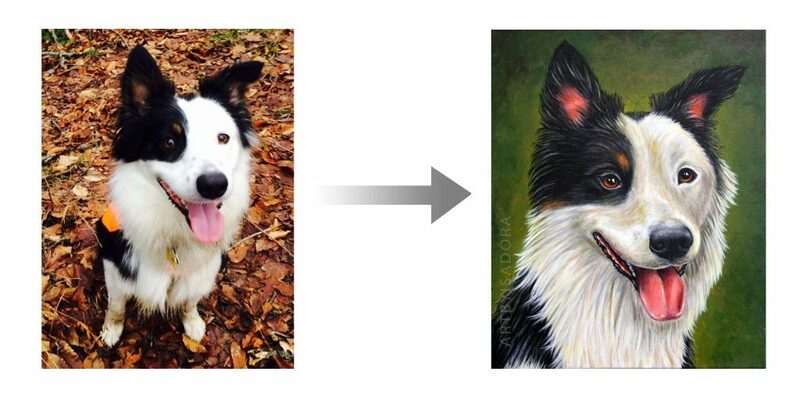 When I paint pet portraits from photos, I don't just ask you for the photo, paint what I see in the picture, and deliver it to you like a painted replica. There is so much more to it! 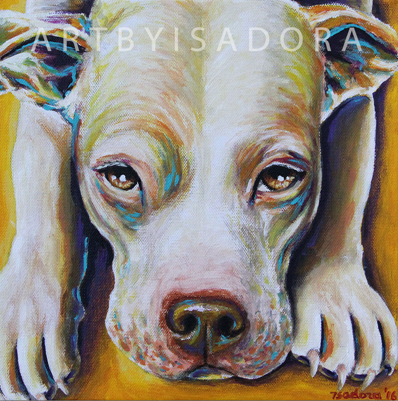 Every portrait involves communication about your pet. What were his or her favorite things to do? What funny little habits did he or she have? 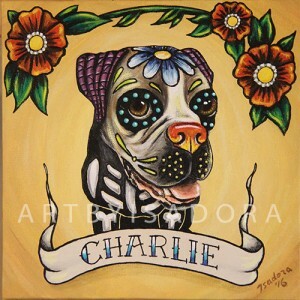 What about your pet just absolutely captured your heart? 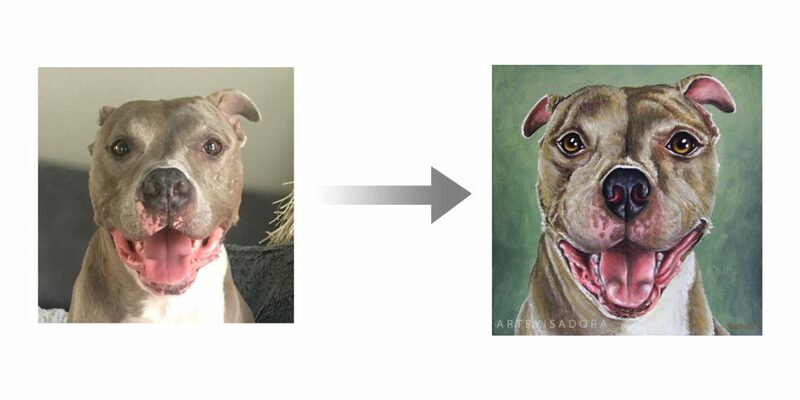 A pet portrait painted from a photo takes on a life of its own, inspired by your pet's heart and personality. 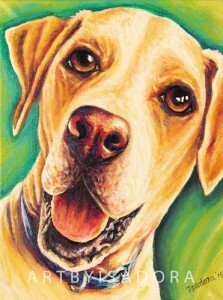 I like to say that when I'm done, the portrait breathes with the life of your pet. 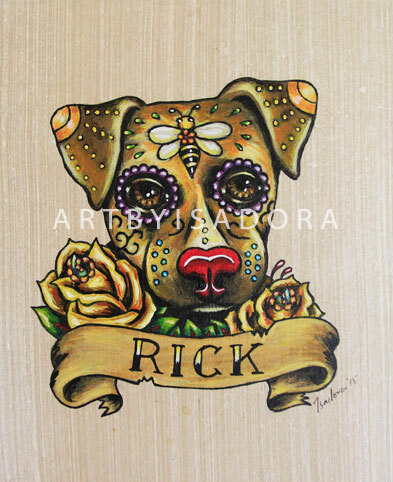 Every brush stroke is painted with your pet's heart and soul in mind. Below are a few samples of photos and the painted portrait that I created from them. 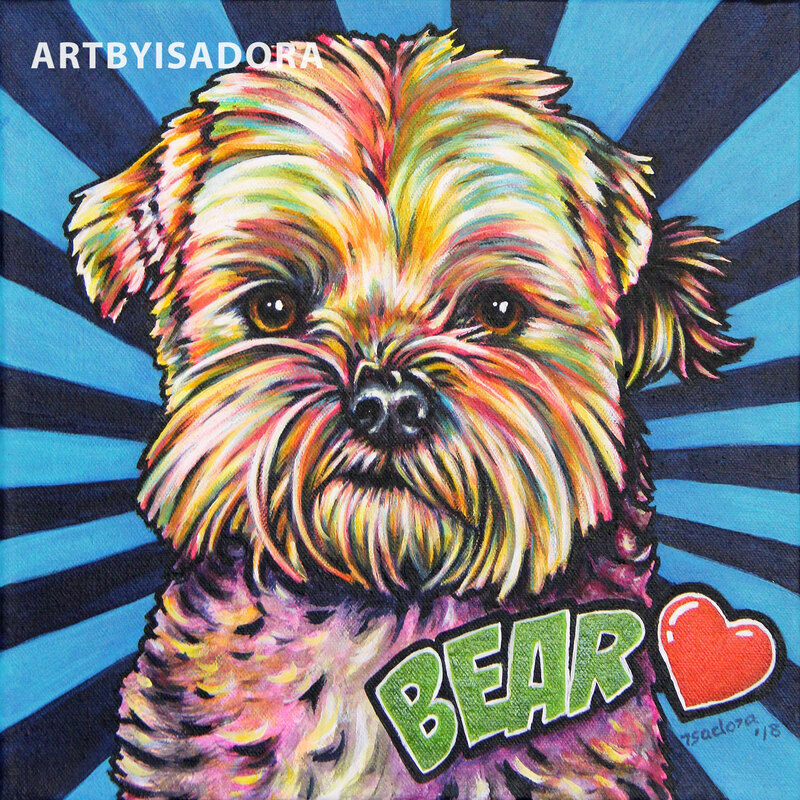 If you'd like a portrait painted of your own pet, click here to place your order. 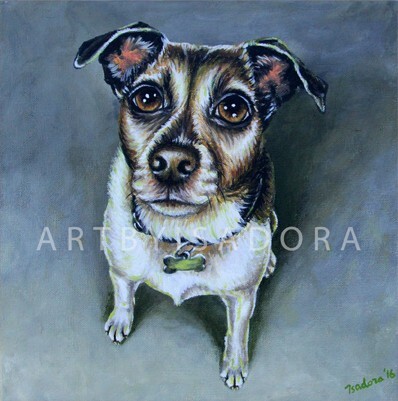 Capturing a great photo of your pet is the first step in getting an amazing painted pet portrait! 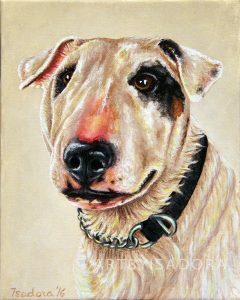 When you hire me to paint a custom portrait of your pet, quality reference material is the key to an amazing finished painting! There are, of course, exceptions to this rule. 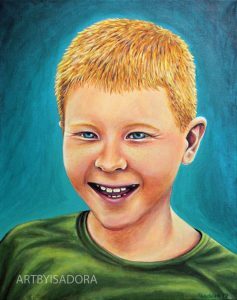 When I'm painting a memorial portrait, I know the customer can't follow my guide to capture an ideal photo, and that's OK. In those cases, I simply ask for as many photos as you can provide, from a variety of angles, and I create a great portrait anyway. 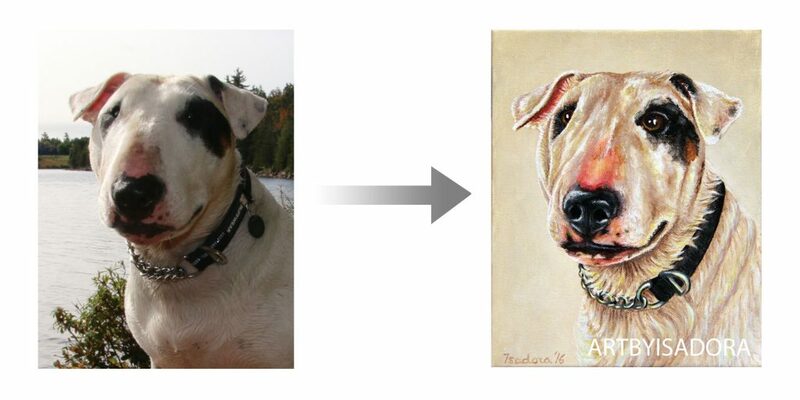 I've even painted a portrait of two best buddy dogs together when one passed and their owner realized he'd never captured that "perfect" photo of the two dogs together. Barring that unavoidable scenario, there's no reason you (yes, YOU!) can't capture a fabulous photo of your pet by following a few easy guidelines. This may even change the way you photograph your pets from now on! 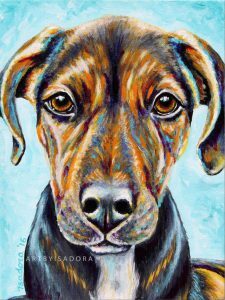 Read on for my fail-safe guide to photographing your pet, and when you're done, be sure to visit my Pet Portraits page for information on ordering a painting created from your beautiful photo! 1. Get down to "pet level"
Photos taken from "human" height tend to look down on your pet, and that results in awkward photos. Get down on the ground yourself for some great angles right at eye-level with your pet. You'll be surprised how much better your photographs turn out with this simple adjustment in angle! Tip: prop a treat up on top of your camera to encourage your pet to look towards the camera with a bright, eager expression! I can paint with great detail if the detail exists within the reference photo itself. Fuzzy, low-quality, grainy or pixelated photos don't give me a lot of fine detail to work with. Zoom in on the photos as you take them to make sure they're focused, crisp and full of all of that great detail I love to reference in the paintings themselves! 3. Light is your friend when taking photos of your pet! Both overly dark photos, taken in deep shadows or dark homes, or overly bright photos with glaring sun, can destroy the subtle shadows and highlights that give the best result in your final photo. However, soft, natural light is wonderful! One great way to achieve this indoors is to take the photo by a glass door or large window, which will allow the light to softly wash over your pet for a beautiful effect. Tip: Pro photographers call the time shortly after sunrise and right before sunset 'The Magic Hour" because the light has a gorgeous, soft, gold-to-red glow. If you can take a photo of your pet outside at this time, nature will provide you with absolutely stunning light!